why are there more young people moving to these islands? 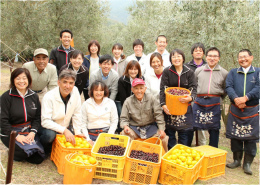 Approximately 100 years ago, Shodoshima was the first place in Japan to cultivate olives. Although pressure from imports caused the cultivated area to drop to 30 ha at one point, due to recent interest in the health benefits of olive oil and increased demand for domestic olives, the cultivated area in 2010 was 110 ha, more than ever before. In particular, direct Internet sales to consumers have been successful. This has made it possible to communicate the producers’ story and pursuit of quality to the consumers, and sell products to consumers who have recognized their value. 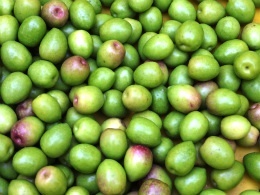 The sale of olives with high added value has created employment opportunities on the island. This has led to more young migrants, people in their 20s and 30s seeking a relaxed island lifestyle different from that of the city. Shodoshima is also known as the “home of soy”, with the area known for soy sauce production since 400 years ago and 21 producers still concentrated in the area today. There is even a soy sauce maker preserving traditional techniques from Edo Period who is gaining fans by communicating directly with consumers and providing a place for newcomers to work. Benesse Art Site Naoshima is an art project taking place on the islands in the Seto Inland Sea put into action by the Fukutake Foundation. 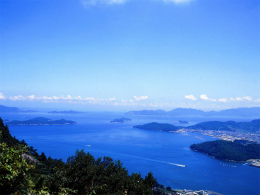 One of these islands is Teshima, which has been visited by many tourists and art fans from Japan and abroad in recent years. Artworks and architecture blend in to the natural island background and enhance the island’s appeal. This island faced Japan’s biggest industrial waste scandal in the past. From around 1980 to 1990, an unscrupulous company brought waste from cities and illegally disposed of it here. The tireless efforts of island residents bore fruit, and the government agreed to remove all the waste. Cleanup of the 920,000 tons of waste is still ongoing. Having restored peace, the island is attracting young people as an island of art, with former residents coming back and visitors liking the island enough to move there. The tour will cover a town hall creating unique policies to bring in new residents, an olive farm employing new residents, a private olive farmer who quit his job in Tokyo to start farming on the island, and a soy maker founded in the Edo Period employing people who returned to the island from big cities. The tour will visit a representative of the residents who protested the illegal industrial waste dumping, the site of the ongoing waste cleanup, an art facility in the middle of rice terraces, and members of younger generations who have been drawn to the island by art. *This press tour is jointly planned and sponsored by Kagawa Prefecture and the FPCJ. Shodoshima Town Hall considers population decline the biggest issue they face. Currently (as of the end of March 2014), the town population is 15,702. It is decreasing by over 250 people every year. The number of deaths of elderly people is expected to increase for the foreseeable future, making population decline inevitable. In response, Shodoshima is actively developing strategies to bring in young people and lessen the impact of population decline. One of these strategies is the Vacancy Bank started in 2007. Information is gathered for vacant residences on the island, and provided to people hoping to move to the town. So far, it has led to contracts on 125 properties. Detached homes are particularly popular, and are booked quickly once they become available. The town also has a system that allows people interested in moving to the town to try out island life by spending up to 3 months in a residence owned by the town. This provides an opportunity for people concerned about suddenly moving to the island to experience the culture and customs of the island first. There is also an overnight, two-day Island Life Experience Tour. Participants’ accommodation and transportation costs on the island are subsidized by the town, and in addition to job hunting and looking for a place to live, they can speak with people who already moved to the island. There were 117 new residents (87 households) in total in the 2013 fiscal year (April 2013 to the end of March 2014). Of these, 81 people (approximately 69% of the total) were in their 20s to 40s, the peak working years. Looking at the different age groups, there were 39 people in their 20s, making them the most numerous and a 1.56 times increase compared to the previous fiscal year. There are indications of change occurring. ◆The tour will speak with the mayor and town officials about changes in the town’s population and measures to encourage new residents to settle there. Inoue Seikoen was founded in 1940, and now has over 70 years of history through three generations. 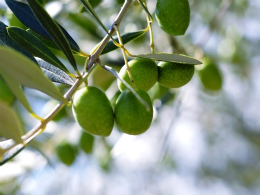 In addition to cultivating olives and citrus fruits on approximately 12.5 ha of farmland, they are also involved in the manufacture and sale of high added value products such as olive oil and products using olive oil as an ingredient, including skincare products and pickled olives. One unique feature of this company is that they sell all their products directly to consumers. Their policy is to bring the consumer the story and feelings behind the product as well. In recent years, there has been more interest in the health benefits of olive oil, and the market has been expanding. 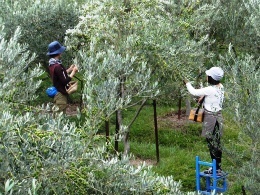 Domestic Japanese olives are also very rare outside of Shodoshima, and consumers seeking quality support the company. Inoue Seikoen’s sales have also been increasing, with annual sales now around 5 billion yen (results as of May 2014). The number of employees has increased to 134, from only about 50 employees six years ago. Around one third of these employees are former island residents who once moved to a big city before returning or people who moved to the island from elsewhere. According to Inoue Seikoen President Tomohiro Inoue, “Industries have to do their part to stimulate local areas. We want to provide employment opportunities.” In 2010, the company also started hiring new graduates. 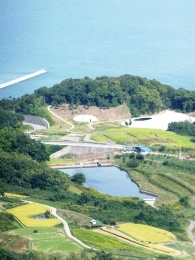 ◆The tour will visit Inoue Seikoen and speak with young workers who returned to or moved to the island from elsewhere. The tour will visit their shop and taste their products. 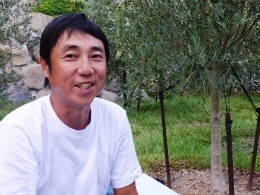 Mr. Noriaki Yamada (47) worked in Tokyo as an office worker before moving to Shodoshima with his family in 2010 to start farming. While working in an office in Tokyo for nearly 20 years, he felt doubts about whether that was what he wanted to do with the rest of his life. 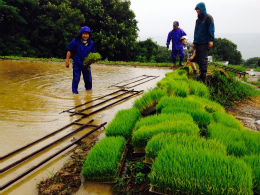 Since his wife was from Shodoshima with its plentiful olive farming, he decided to borrow some fallow fields there and begin farming, which he had no experience with. 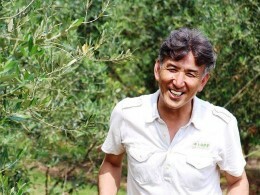 Mr. Yamada grows organic olives, without using any agrichemicals or chemical fertilizers. 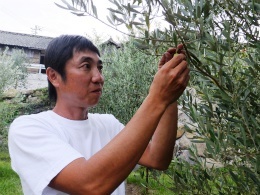 In 2011, he became the first in Japan to receive organic JAS certification for olive cultivation. He studied the pests that were the biggest obstacle to organic olive cultivation in Japan, the olive weevil (indigenous to Japan), determined what kind of fields they dislike, and used other insects that were their natural predators to succeed in organic cultivation. The olives harvested from his 600 trees are all sold directly, either as oil, salt-cured or as is. “I didn’t start with the intention to do anything beautiful, I was just looking for something original to make a small-scale business feasible. That turned out to be organic farming and direct sales.” Thanks to word of mouth among restaurant chefs, the fresh and salt-cured olives of this year’s harvest sold out with advance orders. ◆The tour will visit Mr. Yamada’s olive orchard, speak with him, and observe harvesting. Making soy sauce starting from the barrel to protect tradition, new residents will want to work at this soy sauce maker. Yamaroku Shoyu was founded approximately 150 years ago. Constructed over 100 years ago, the storehouse is a national Registered Tangible Cultural Property. There are around 100 kinds of microorganisms such as yeast and lactic bacteria living in the timber and dirt walls of the old wooden structure. Yamaroku soy sauce is still made using the same method from the Edo Period, without using any enzymes or additives to speed up the brewing process. Although it takes longer, the complicated interactions throughout the fermentation process of the microorganisms living in the storehouse create soy sauce with a mellow flavor. The large cedar barrels that have been used for over 150 years in the storehouse are essential to the process. However, there is now only one company left in Japan that makes these barrels. 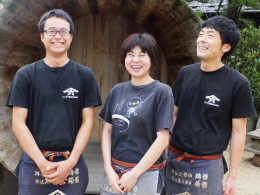 The fifth-generation president of Yamaroku Shoyu, Yasuo Yamamoto (42) responded to this crisis by training at that barrel-maker and making a barrel himself. The new barrel he made is now fermenting soy sauce along with the 150-year-old barrels. Mr. Yamamoto’s parents told him “The business doesn’t make much money, so you don’t have to take over,” and so he found work at a local food manufacturer. Working in sales, he was disillusioned by the pursuit of saving money above all else, and after reconsidering the value of the soy sauce made by his family over generations, he decided to take over the family business. He has been gaining fans throughout the country with his efforts to create quality products and show the storehouse to consumers using the Internet. In addition to Mr. Yamamoto, employees include Ms. Sae Takahashi (41) and Mr. Tsutomu Fujimoto (33), who returned to the island from the city, and Mr. Takahiro Hiramatsu (29) who moved to the island from Kyoto. 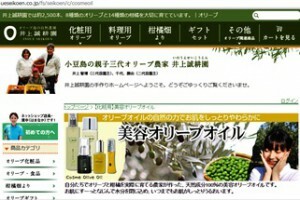 The staff commented that “The president has interesting ideas” and “It was interesting helping to make a new barrel”. ◆The tour will visit Yamaroku Shoyu, and speak with Mr. Yamamoto and the young employees in their 20s and 30s who moved from other areas to work at the company. The tour will also observe the storehouse where soy sauce is made. Shodoshima Olive Cattle are a wagyu brand of cattle fed the by-products leftover from the production of olive oil. Only those cattle of Grade 3 or higher are selected from cattle fed over 200g of olive by-products every day for two months before shipping. It is well regarded for its tender meat and sweet fatty parts. 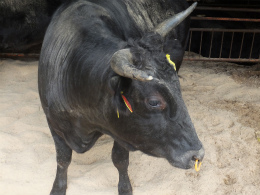 A prefectural study has also shown that it has more antioxidants than other types of wagyu. An island of natural beauty, Teshima was actually the site of an illegal industrial waste dumping scandal. 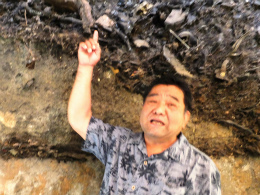 For 10 years from around 1980 to 1990, a private contractor brought vast amounts of industrial waste to the island from Kansai cities, illegal dumping and burning it there. The total amount was approximately 920,000 tons. The cleanup that started in 2003 is still underway, and projected to complete in February 2017. Island residents started protests early on, but they were ignored until the problem came to light after 10 years thanks to the Hyogo prefecture police charging the contractor. In 1993, residents sought an environmental dispute arbitration (*) based on Act for the Settlement of Environmental Pollution Disputes to restore the island to its original condition. (*A system for quicker environmental dispute resolution than the courts) In order to raise public awareness, they continued grassroots efforts such as marches in Tokyo and holding talks seeking support in over 100 locations around the prefecture. In 2000, at the 37th arbitration session the prefectural governor at the time apologized and an agreement was made to remove and dispose of the waste, 25 years after the scandal first began. In response to this incident, the Waste Disposal Act was significantly reformed and regulations for disposal facilities were tightened. The Basic Law for Establishing the Recycling-based Society and other recycling laws were also established. It is said that the industrial waste illegally dumped on this small island was brought in from big cities. It can be considered an example of the dark side of a society based on mass consumption and mass disposal. 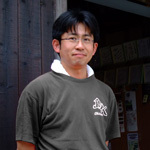 A long-time member of resident groups involved in the protest, Teshima Resident Council against Industrial Waste Dumping Director Shozo Aki commented “I hope that people will consider the example of Teshima and help create a sustainable society without passing debts on to the next generation”. 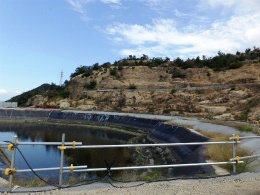 Based on the environmental dispute arbitration agreement, the prefecture has been cleaning up the industrial waste dumping site since 2003. The industrial waste is stacked up to 20 meters deep in some places, with a total estimated weight of 920,000 tons. 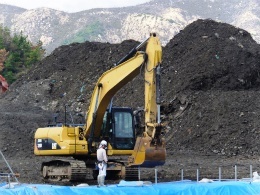 The industrial waste dug up using heavy machinery is transported to Naoshima were it is burned or melted. 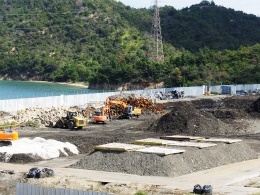 Since the site is near the sea, a 360-meter-long impermeable wall is set up along the shoreline to prevent groundwater and rainwater containing harmful materials from the waste from passing into the sea. 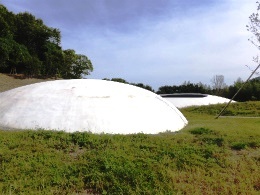 The contaminated water being held back is then drawn up using a pump and purified in a neighboring wastewater treatment plant, before being released into the sea. The cleanup is projected to finish in February 2017, with a total cost of 55 billion yen. The cost is being covered by the national and prefectural governments. The prefectural government now has senior officials take a training course on Teshima to learn about government responsibility since FY 2002. ◆After speaking with the prefectural official in charge of the cleanup, the tour will observe the site where cleanup is still ongoing. Benesse Art Site Naoshima is an art project taking place on Naoshima, Teshima and Inujima islands in the Seto Inland Sea through the efforts of the Fukutake Foundation and Benesse Holdings, Inc.. A variety of modern art projects are being carried out in Teshima. The Teshima Art Museum (collaboration between artist Rei Naito and architect Ryue Nishizawa) rests on a hill overlooking the Seto Inland Sea. Shaped like a water drop, the museum gives the impression that it has merged with the nature of the island. The area is surrounded by rice terraces. 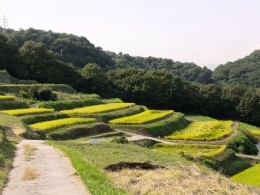 These terraces had been left fallow, but the Fukutake Foundation worked together with local residents to revive them. The island’s art and idyllic scenery now attracts many visitors from both Japan and abroad. ◎Note: Photography will not be permitted inside the Teshima Art Museum, but pictures for press use will be available on request from a dedicated website. The Koebi-tai (Little Shrimp Squad) is a volunteer group that helps with art projects on islands in the Seto Inland Sea, such as the Setouchi International Art Festival (Setouchi Triennale, held every 3 years). People of all ages from across Japan and the world have gathered on the island to participate. The Koebi-tai operates on a concept of “If you like art and islands, and want to help with art festivals, anyone can join at any time!” (Their mailing list has around 5000 members, and 1300 volunteers helped with the 2013 Setouchi Triennale). People in their 20s and 30s from throughout Japan make a particularly large portion of their membership, helping to plan and run art events on the island in addition to the Triennale, volunteering at local festivals, and planning concerts and markets. With population decline progressing, the islands need young people, and there are many opportunities for them to participate. ◆Ms. Ayako Amari (33), a Koebi-tai member, will speak about their activities on the islands and act as a guide for the Teshima Art Museum and rice terraces. 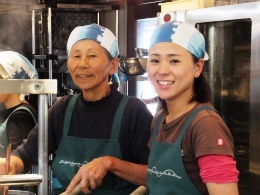 ◆The tour will visit Shima Kitchen, where local women and young people who moved from elsewhere work together, and have lunch made using local ingredients. 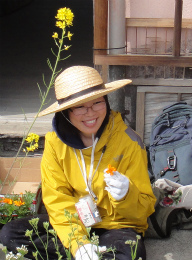 The tour will also speak with the manager Ms. Fujisaki, who returned to the island. The Special Places of Scenic Beauty designated by the national government are also known as Garden National Treasures. Ritsurin Garden is the largest of the 24 gardens in Japan designated as Special Places of Scenic Beauty, with an area of 75 ha. The lord at the time started construction on the garden in 1625, and it took 100 years to complete. 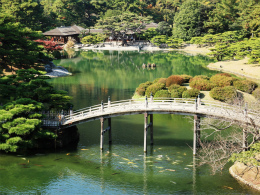 The Michelin Green Guide gave it tree stars and said it was “worth a detour”, demonstrating how Ritsurin is highly regarded as one of Japan’s best gardens. ◆The tour will visit Ritsurin Garden, a famous Kagawa landmark. Guided by the head gardener, who helps preserve the garden passed down for the past 400 years, the tour will take a walk decorated with fall colors. *The time table of visits below is still being determined. The order may change. (2) FPCJ and Kagawa Prefecture will not be liable for any inconvenience, trouble or accident that might occur in the course of the tour. (3) Participants will have to cover a portion of the cost for this press tour, but it is not a profit-making enterprise.